School has been in session since August 19. That's about 4 1/2 weeks. 2 of those weeks school was held all 5 weekdays. High school has late start on Thursday, middle school has late start on Friday. Julia's swim practice started just after school did, Sydney & Gretchen started last week. Lacrosse and Ultimate have started and I am back on track for making dinner. (The girls were very saddened by my lack of dinner skills in the summer.) Harvesting the garden is in full swing as is trying to fit as many bike rides in before the weather turns. We cut corn off the cob and froze just over 6 full gallon bags. We are really going to enjoy that for the next few months. 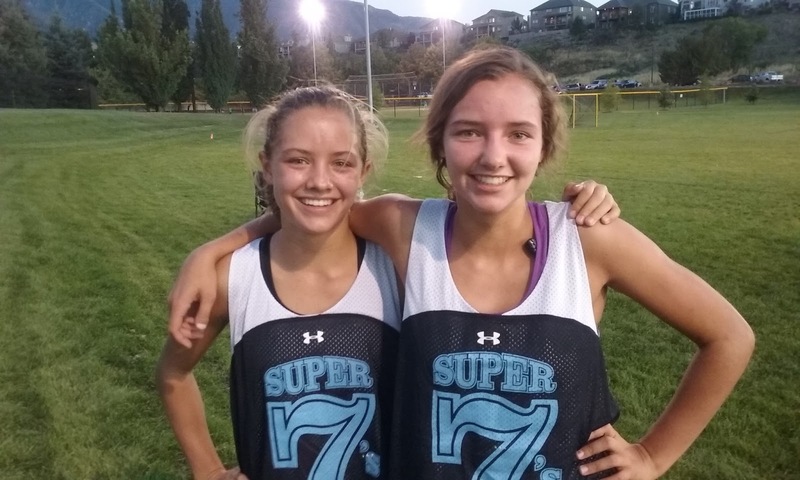 7's lacrosse is a faster version of regular lacrosse that Sydney and Gretchen are playing this fall. I like this version better than the original. 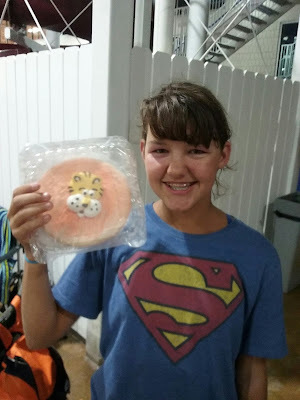 Julia swam in a meet called the "Cookie Kickoff". Each swimmer got a cookie as big as their head. Homecoming was a blast for these two. Senior year is proving to be awesome. Samantha is doing so well. She loves where she is and especially loves the food. So many new salsas! "It doesn't matter if we don't mean to do the things we do. It doesn't matter if it was an accident or a mistake. It doesn't even matter if we think this is all up to fate. Because regardless of our destiny, we still have to answer for our actions. We make choices, big and small, every day of our lives, and those choices have consequences. We have to face those consequences head-on, for better or worse. We don't get to erase them just by saying we didn't mean to. Fate or not, our lives are still the results of our choices. I'm starting to think that whem we don't own them, we don't own ourselves." I would not have felt as strongly about this book if the main character had reached a different conclusion. I'm most excited by the fact that this author is someone I know nothing about - her faith, her choices, her life - nothing. It's just another person who makes sense to me. There are so many books out there and I love to read a variety and explore ideas different from mine, but I am happy in this one that the main character figured out what I think is most important.